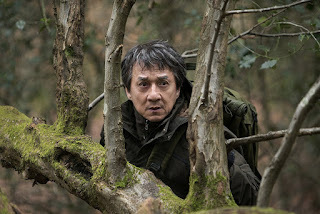 A revenge action thriller set against the backdrop Northern Ireland tensions, The Foreigner has almost too much plot but also plenty of well-executed action. In London, a terrorist bomb blast claimed by the "Authentic IRA" kills many civilians, including the daughter of Quan (Jackie Chan), an elderly Chinese immigrant, restaurant owner, and special forces Vietnam War veteran. Quan has had a rough life, including losing two previous daughters as well as his wife. The British government leans on Belfast-based Irish Deputy Minister and ex-IRA member Liam Hennessy (Pierce Brosnan) to find out who is behind the attack. He has his own agenda to pressure the British cabinet into issuing pardons for former terrorists. Quan identifies Hennessy as the man who could name the bombers, and relocates to Belfast to start pressuring the politician with acts of violence. Meanwhile Hennessy has his hands full trying to keep former IRA colleagues in check, as internal divisions emerge particularly with his friend McGrath. With Quan proving to be a formidable threat, Liam calls on his New York-based nephew Sean for help, while Hennessy's wife Mary (Orla Brady) has her own plans to settle old scores. Tightly controlled by director by Martin Campbell, The Foreigner presents a new screen persona for Jackie Chan, moving into Liam Neeson territory as an older man resorting to violence to settle scores. 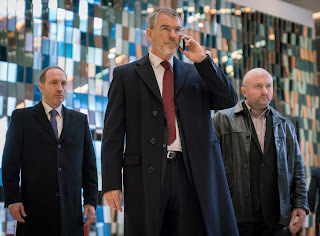 Pierce Brosnan also steps forward with a refreshingly different role, moving away from his suave James Bond mannerisms and revealing a more conniving edge with a robust Irish accent. While Chan and Brosnan infuse the two main characters with plenty of depth, the David Marconi script, based on the book The Chinaman by Stephen Leather, layers on hefty globs of plot. To its credit, The Foreigner is lot more than a standard vigilante story, but it also does expand in many different directions at once. An Irish terrorist cell is holed up in a London flat, and one of the members has a close connection to Hennessy. Liam's wife and nephew have their own secrets and motivations. Concerned high-level government types walk in and out of offices, always on the phone and alternating between threatening and cajoling Hennessy towards putting a lid on the violence. A counterterrorism unit headed by Commander Richard Bromley (Ray Fearon) tries to catch up with both the IRA splinter group and Quan. A reporter becomes a pawn in the unfolding plot. The whole tenuous peace process in Northern Ireland is brought to the fore, as a hard fought peace hangs in the balance, middle-aged men who were once warriors dredging up the past and threatening the present. And numerous goons enter the picture to try and sort out Quan. With so much going on, the film has to divide its time between the slow-burning internal Irish tensions and Quan's quest for revenge, and the plot holes multiply accordingly. The more notable logic gaps include Quan's remarkable ability to always be one step ahead of both his pursuers and the weight of the British authorities, plus his exceptional combat resiliency against multiple foes. Nevertheless Campbell directs the action scenes with almost perfect pacing and intensity, finding the sweet spot where energetic editing supplements rather than overwhelms battle theatrics. The Foreigner has an overflowing narrative, but also enough talent to focus when it matters most.